Freecycle.org is a famous website driven by people who are giving (and getting) stuff for free in their own towns. With more than 7 million members around the world it helps you find what you need for free. To sign up, find your community by entering it into the search box above or by clicking on ‘Browse Groups’ above the search box. Remember, though, that the website runs on charity- to keep it going, you need to give as well as get! A ‘Wanted’ section- if you can’t find what you want on the site, post a request here, and maybe someone will get back to you! 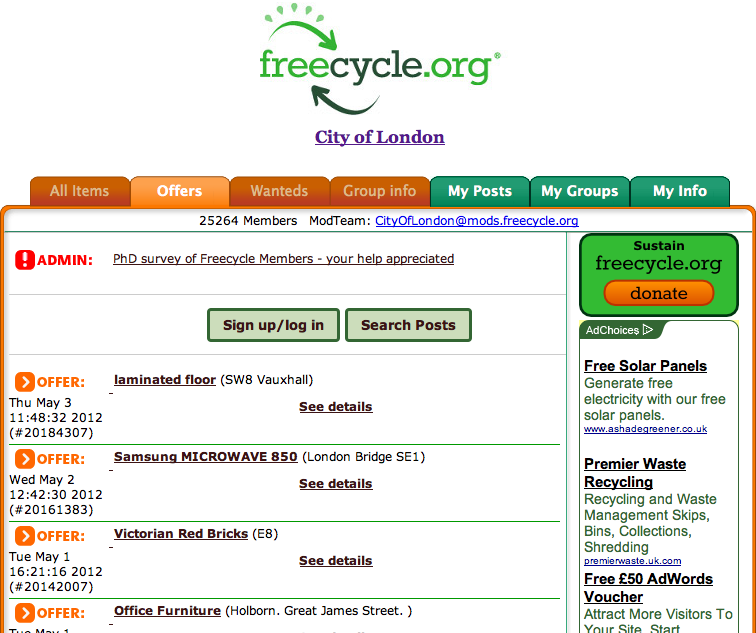 For anyone who cares about the environment and has old things to give away, Freecycle.org is definitely worth a try- despite the outdatedness of the website and how quickly things are snapped up when they’re put on the site, there’s enough free stuff on the site to interest anyone looking around for some hidden gems to own- and seeing as how it won’t cost you a penny, you might be very happy with what you come away with. Go back to Free Goods and Services category to find more websites and organisations offering free goods and services in London.